I’m so sorry if my tone towards crochet offended anyone, but you completely misunderstood me. It’s actually pretty funny. You see, the official Grumperina stance towards crochet is as follows, “insufficient knowledge to comment.” 🙂 That’s why I insist that we don’t talk about it, or that we talk about it in hushed voices – it’s not that I feel negatively about crochet, it’s more that I have no business owning a crochet hook, let alone telling you about my crocheting adventures. It’s the equivalent of posting details of how I single-handedly changed all the electrical wiring in my apartment – I don’t know anything about that stuff, so I shouldn’t be talking about it, and you’d be wise not to read ;). Not that I would ever change electrical wiring on my own… I have such a fear of fire… I’m just saying it as an example. So, the little gift for little Deliciousness is complete! You’ve seen the hat, and those two other little things are thumb-less mittens! Baby’s first winter accessories set – awww! Pattern: Shining Star by Kate Gilbert plus little mittens of my own construction. 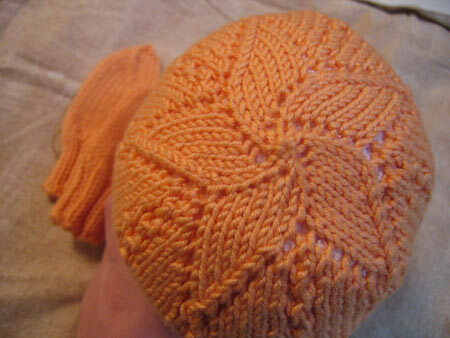 Yarn: Debbie Bliss Baby Cashmerino, 55% Merino wool, 33% Microfibre, 12% Cashmere, color #104/orange. As before, only 1 skein! Actually, even less – 36 grams/98 yards. Needles: Most of the knitting was done on US4 dpns, but I used other sizes as necessary. Size: The hat is 11.5” in circumference and 5.75” deep, completely unstretched. The mittens are 3.75” in circumference and 2.75” deep (plus 1.5” ribbing). My completely unscientific market research (measuring stuff at baby H&M using my palm as a measuring tape) indicates that this is the right size for baby to wear right now, which is my intention. Modifications: Using the same exact reasoning as before, I substituted Debbie Bliss Baby Cashmerino, knit the baby size, and actually got a baby-sized hat at the end! Same mods on the crown increases, too. The color you used is just yummy. And I’m quite proud of your crochet job, very nice and subtle. I love the thumbless mitts! They are adorable and you did a great job. I have a new little nephew who will undoubtedly get a pair from me just like this. Look at those thumbless mittens! They are the cutest! What a perfect way to use the rest of the yarn. How cute – a matching set. Deliciousness will be the best dressed baby in town. Love your blog! What a lucky baby – BTW that colour would look great with my grey hair!! I always find my self smiling when I read your blog. Hope you are 100% healthy again! I love your “Jaywalker” sock pattern – knit my first pair in Dancing from Knit Picks and now want to try it in a solid colour. Such a neat design. Thanks! as a crocheter, i wasn’t offended at all. that’s the beautiful thing about crochet though. i think it’s much easier to wing it with crochet than it is with knitting. What a cute baby set. What a lucky little girl. And that hat is growing on me the more I see. How adorable! And what a great idea to make thumbless mittens for a baby (I guess that’s a fashionable way to keep them from scratching themselves). Now, when do you think that hat pattern might be coming? I’m tired of being mismatched (my scarf and gloves are both bright red, and the only warm hat I have is shades of blue). Very, very nice! I have a strawberry blond Deliciousness myself (though he is three years old now) and that color would look fab on him. Thumbless mittens are awesome for babies. Trying to get a less-than-four-year-old thumb into a gusset is like crochet, or rewiring your apartment. LOL! Beautiful deliciousness, both hat and mitties! As a stitcher of many stripes (knit, crochet, embroidery), I second that POV on crochet. I wasn’t offended at all. The idea is to use the tool that best helps bring your creative vision to life. If it’s the hook, then so be it! ah, so cute. thumbless mittens rule. Oh my gosh… I love the hat, but with the mittens? *extreme cuteness overload* I have a couple of upcoming babies in my circle of friends, and now this is definitely going on my list of projects! Just absolutely cute!!!!! Crocheting is a travesty!!! aaawwww, so cute! so, so cute! Grumperina, you slay me with your inventiveness, your know-how (or fudge-how!) Man. 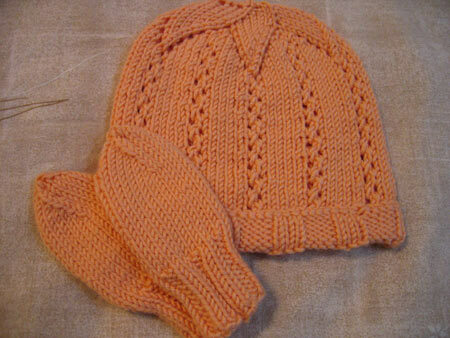 I, too, breathlessly await the pattern for your Sarit hat and beg to know the secrets of making those baby mittens? Tooooooo cute. I’m totally smitten! Beautiful beautiful beautiful! Love the thumbless mitten idea. You know, if you did the star part is a nice sage green color, it would look just like the baby was a little peach! I’m overwhelmed by the cuteness! Awwwww…. so so so cute. You always amaze me with your ability to figure patterns out and make them even better. That is a great great gift! cutey cute! I love that peachy color. Would love to see the little Deliciousness modeling the new items! Absolutely adorable. That color is so soft and yummy! You have inspired me….and I need to make a baby gift anyway. I have to agree–totally adorable. That yarn looks yummy too! The mittens are precious, and oh, the color! I love that soft shade–it’s just orange enough to have some kick to it. A step or two above boring baby pastel. That is so adorable. The mittens look so warm, I want a pair too! The yarn you used looks Delicious. Love the grumpecue all on its own, but don’t think I’d ever work up the gumption to try it on my own. I share your opinion and talent for crocheting! I crochet enough only to put easy edgings on my knitted objects. No offense to the crocheters of the world, but it’s not something that I enjoy doing or can do well–I wonder if there is a correlation here?? Your baby hat and mitts are precious!!! i think you’re psychic, Kathy! you do great knitting! really enjoy reading about all that you put into it.